By C H A S . D A L E Y , B.A. , F.L.S. Memorials on the Explorers' Routes. In the year 1924 the centenary of Home and Hovell's expedition occurred, and a chain of memorial cairns, 38 in number, was erected along the explorers' route in Victoria from Albury to Corio Bay. In an address at the unveiling of one of these cairns at Bulla in 1925, the writer urged that the movement should be extended so as to embrace the routes of Stuart, Mitchell, McMillan, and Strzelecki. In accordance with the suggestion, a historical Memorials' Committee, representing the Lands Department, Education Department, Historical Society of Victoria, Town-planning Association, and the Railways Department, was formed to carry out the project, Sir James Barrett being appointed chairman, and the writer, honorary secretary. Immediately, as the first portion of this extensive scheme, steps were taken to mark out the routes of McMillan and Strzelecki in Gippsland, and shire and town councils, progress associations, State schools, and the public generally along the lines of routes were invited to co-operate in the erection of memorial cairns at suitable places, carefully drawn maps of the routes with necessary particulars being distributed. 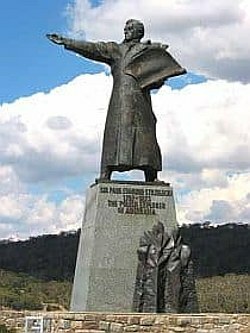 In response, twenty-five memorials between Benambra and Port Albert on McMillan's route, and front Heyfield to Corinella on Strzelecki's were erected, entirely at local expense. In 1927, His Excellency Lord Somers, Governor of Victoria, accompanied by the members of the Historical Committee, in a week's tour successfully performed the unveiling ceremonies along the routes. The memorial cairns erected on the Count's route were at Heyfield, Loy Yang, Koornalla, near which he had changed his course westward, North Mirboo, Leongatha, Korumburra, and finally Corinella on Western Port, near Settlement Point. A Link with the Polish Explorer. In connexion with these celebrations the writer received a letter of inquiry and an appreciative message from the Polish Consul at Sydney, with the information that Mrs. Wanda Szalla, the grand-niece of the Count, was then on the Consul's staff. The „mountain” referred to is the tumulus raised at Cracow over the grave of Kosciusko. At Madam Szalla's wish an account of the erection of the memorial cairns in Gippsland, with photographs of the same, was forwarded to her by the writer for publication at Warsaw—to which city the lady was about to return. In 1940, the centenary year of the ascent of Mount Kosciusko, a commemorative bronze tablet, recording the Count's eventful undertaking, was placed in position on a granite boulder at the summit of the mountain, and was unveiled on 17th February in the presence of Sir Henry Manning, representing the Government of New South Wales, and of a number of other representative persons, by the Polish Consul-General and Madame du Noskowski. Children from the Cooma and Jindabyne schools attended and sang the Polish national anthem and other suitable songs. A large party of visitors on horseback journeyed 70 miles from the Corryong district in Victoria for the occasion. The cost of the tablet was to be defrayed by subscriptions of pennies from the children in the State schools of New South Wales. On the tablet the date of the ascent of the mountain is given as 15th February, 1840, which is at variance with Macarthur's field-book which records that on March 12th, in the Count's company, he reached the summit. Since writing the above I have read a very informative and appreciative article entitled, „Sir Paul de Strzelecki”, by Mr. W. L. Havard, of Sydney, which appeared in the Journal and Proceedings of the Royal Australian Historical Society, Vol. XXVI., Part 1. The writer expresses uncertainty as to the dates given for the setting-out from Ellerslie preliminary to the divergence to Kosciusko, and also as to the date of the ascent. Mr. H. F. Gisborne wrote an account of the journey based upon Strzelecki's loose notes, after the Count's arrival in Melbourne, which appeared in the Port Phillip Herald on 23rd June, 1840. 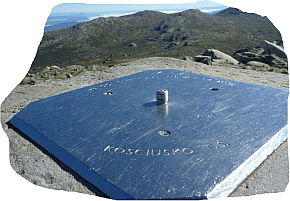 The time of the ascent of Mount Kosciusko seems without adequate verification to have been taken as at noon on the 15th February, 1840; and this date has been repeated without question in subsequent accounts of the ascent. Against this there is the definite statement in Macarthur's field notes, commencing „March 9th, 1840,” and with dates following duly to the 14th, when after the descent, the Count was „verifying his observations,” prior to journeying south-wards from the Murray river. Having left the summit of Mount Kosciusko on 12th March the party reached Macalister's outstation, Numblamungie, on the Tambo river, on the 26th, a journey which, even in those days, could easily be made within a fortnight; whereas if the ascent had been on 15th February, the party must have taken nearly six weeks to traverse the distance, which is highly improbable. Pertinent to the question, Mr. Havard notes in his article that Strzelecki records in his Physical Description meteorological observations taken at the starting-point, Ellerslie, on 26th, 28th, and 29th February, 1840. These dates would fitly accord with Macarthur's later date, 12th March, but obviously not with the other date, 15th February, for the ascent. which would also fit in with the dates of the meteorological observations and the ascent on 12th March. In a footnote to his article, Mr. Havard says that in a copy of the Port Phillip Herald preserved by Mrs. R. G. Mockridge of Newtown, Geelong, a granddaughter of James Riley, who accompanied the Count and Macarthur, the printed date „15th February” given for the ascent, is „overscored with ink” to read „12th March” — Macarthur's date in his field-book. A reasonable inference is that Riley himself had made the correction in the press account. As a minor point, the Port Phillip Herald on 2nd June, 1840, gives „12th February” not 15th for the ascent, where the day, but not the month, agrees with Macarthur's date. The weight of evidence, I think, is conclusively in favour of 12th March as the true date of the ascent of Mt. Kosciusko. Unfortunately the complete pages of Macarthur's field-book are not available for reference, or the date when Strzelecki joined Macarthur, and subsequent ones would be doubtless obtainable. Mr. Leslie Macarthur, from whom the notes descriptive of the ascent were received, while prosecuting a search for oil near Terang in the Western district of Victoria, was stricken with illness, and died in Melbourne some time afterwards. IIis papers and correspondence may have been dispersed or destroyed, and the information desired altogether lost. McMillan's explorations had been at once instrumental in opening up for settlement the country from Port Albert along the route to Monaro and the Yass Plains, but it was not for nearly 30 years that the dense forest country, through which, with much labour and privation, Strzelecki's party had strenuously forced their way, began to be occupied. Later, with gradual railway extension, supplemented by the transformation made since the year 1912 by the Country Roads Board with its slogan of „A road to every home”, not only has the region been made highly productive in regard to agriculture, cattle-raising and dairying, but the extensive coalfields to the south-west have proved to be of great industrial value to Victoria. The town at the terminus of the central railway line of this fertile region is named after the explorer, and the greatly denuded Strzelecki Range in South-Western Gippsland, so fitly named in the Count's honour by Captain Stokes of H.M.S. Beagle. When surveying Corner Inlet, also commemorates the adventurous Pole who first traversed its fastnesses. In addition, his name has been given to the highest peak, 2,550 feet, on Flinders Island, and to a peak on Three Hummocks Island in Bass Strait, as well as to a tributary of Cooper's Creek in South Australia. Count Strzelecki, after his sojourn in Tasmania, left Launceston for Sydney on 29th September, 1842. After his departure from Australia he was presented in London with a sum of £400 and a complimentary address, testifying to the high regard and esteem in which he was held by the residents of Tasmania and especially by Sir John and Lady Franklin, his intimate friends. After some months in Sydney, Strzelecki left on 22nd April, 1843, for Singapore, and spent some time in Eastern Asia before returning in 1844 to England. In the following year, he published the Physical Description of New South Wales and Van Diemen's Land and became naturalized as a British subject. The Royal Geographical Society, on 25th May, 1846, awarded him its gold Founder's Medal for his researches. Deeply sympathetic and sensitive to distress and suffering, he showed his philanthropic spirit in outstanding active service in relief measures for the famine in Ireland in 1846-7, receiving recognition for his unselfish work by nomination on 21st November, 1848, as a Companion of the Bath. He achieved a high reputation in literary and scientific circles in London, and on 3rd May, 1853, was made a Fellow of the Royal Geographical Society and later a Fellow of the Royal Society of London. In other directions his philanthropic efforts were freely exerted, e.g., in assisting emigration of families to Australia, the work in which Mrs. Caroline Chisholm did such great service. He was a useful member of the Crimean War Committee, and was keenly interested in social reform and humanitarian projects. In 1860, the University of Oxford conferred the honorary degree of D.C L. upon him, and on 30th June, 1869, as n final honour for his Australian experiences and labours, Her Majesty bestowed upon him the Order of St. Michael and St. George. His death in the year 1873 ended the distinguished and remarkable career of one who from humble beginnings attained high honour in usefully serving his day and generation.